Note to Readers: On March 1, 2011, The Rational Walk published a comprehensive report, Berkshire Hathaway: In Search of the Buffett Premium, which examines the intrinsic value of Berkshire in great detail. Order the report for immediate electronic delivery, or download our free 22 page sample (pdf) — there is no registration required for the sample. Warren Buffett provided an unusual level of insight into his views regarding Berkshire Hathaway’s intrinsic value in his latest letter to shareholders which we discussed in more detail when it was released last week. While Mr. Buffett gave us his views of Berkshire’s normalized earnings power along with several other guideposts to his thinking on Berkshire’s intrinsic value, he did not present a specific estimate. However, he came extremely close to doing so in the case of GEICO. In this article, we will take a look at Mr. Buffett’s comments on GEICO and potential implications for the intrinsic value of Progressive, GEICO’s most fierce competitor. Mr. Buffett’s letter describes his personal experience with GEICO over the past sixty years as well as the terms of Berkshire’s investments in the company. In 1996, Berkshire purchased the 50 percent of GEICO that it did not already own for $2.3 billion implying a value of $4.6 billion for 100 percent of GEICO. At that time, GEICO had tangible net worth of $1.9 billion which means that Berkshire valued GEICO’s goodwill at $2.7 billion. Berkshire effectively paid 2.4 times tangible book value which was considered a high valuation at the time. Although a careful parsing of the statement shows that Mr. Buffett does not explicitly state that GEICO’s economic goodwill is $14 billion, it is strongly implied that using the “97%-of-premium-volume yardstick” is just as appropriate today as it was in 1996 when Berkshire acquired full control of GEICO. Some analysts may question whether this is the case given that GEICO today has a much higher market share than it had in 1996 and presumably growth prospects from today’s levels might be slower. We do not have individual balance sheets for all of Berkshire’s insurance subsidiaries but GEICO publishes selected financial information based on statutory accounting rules, which generally presents a more conservative picture of a company’s net worth when compared to GAAP accounting. According to data on GEICO’s website, policyholders’ surplus was approximately $6.5 billion as of December 31, 2010. The policyholders’ surplus figure should be free of intangibles at this point (see this report for some information on statutory accounting and goodwill). Therefore, if GEICO’s goodwill is worth $14 billion, it follows that the company as a whole is worth approximately $20.5 billion based on Mr. Buffett’s valuation methodology. The similarities between the companies are striking particularly when viewed from the perspective of very consistent underwriting profits over the past decade. Over the 1999 to 2010 period, GEICO grew premiums earned at a 10.5 percent rate while Progressive grew premiums at a 8.8 percent rate. The average combined ratio was 93.6 for GEICO and 92.3 for Progressive. 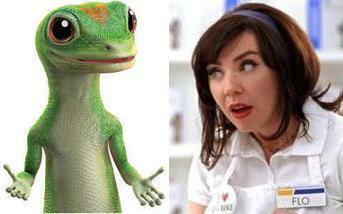 In general, GEICO posted lower expense ratios while Progressive posted lower loss ratios in most years. 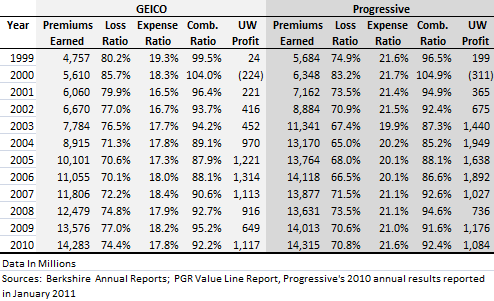 In 2010, earned premiums were very similar for GEICO and Progressive and underwriting results were almost identical. We have not performed a thorough valuation of Progressive, but it does not seem too far of a stretch to consider the implications of Mr. Buffett’s views on GEICO’s intrinsic value on Progressive given the similarities between the two companies. As of December 31, 2010, Progressive had tangible equity (based on GAAP) of $6,049 million. If we use the “97%-of-premium-volume yardstick” to estimate Progressive’s economic goodwill, this results in a goodwill estimate of $13,886 million. The total intrinsic value estimate would be $19.9 billion, or slightly over $30 per share. Progressive’s market capitalization as of Friday, March 4 was $13.78 billion, or $20.88 per share. Are we safe in assuming that Mr. Buffett would value Progressive in the same manner as he values GEICO? Possibly not since he could believe that GEICO has important advantages over Progressive that will result in a higher level of growth going forward. Past history would suggest that GEICO appears to be able to grow at a somewhat higher rate than Progressive while also maintaining excellent combined ratios. Perhaps this is due to important competitive advantages emanating from a higher level of goodwill at GEICO compared to Progressive. However, we can also look at Progressive’s valuation from another perspective. Using the market value of $13.78 billion, implied economic goodwill assigned by the market is currently $7.73 billion. As a percentage of last year’s earned premiums, economic goodwill is currently at a “54%-of-premium-volume yardstick” as compared to the “97%-of-premium-volume yardstick” that Mr. Buffett used in 1996 to value GEICO and appeared to endorse as being equally relevant today. It would appear that Progressive’s track record is strong enough to justify a higher valuation if we use Mr. Buffett’s methodology even if Progressive’s position is not quite as strong as GEICO’s. We should stress that a $19.9 billion valuation for Progressive would be quite aggressive at nearly 3.3 times tangible book value. In addition, we are not stating that Progressive is worth $19.9 billion at this time, having not performed sufficient due diligence on the company to make such an assertion. Instead, we are simply making the observation that Warren Buffett’s valuation of GEICO seems to imply that he would regard Progressive as undervalued if he views Progressive and GEICO as having similar economic characteristics. Of course, he never made any such statement. But the inference is, at the very least, interesting and warrants further study of Progressive. Disclosure: Long Berkshire, No Position in Progressive. (1) GEICO perhaps has a larger portion of their investment in stock than PGR, whose is mostly bonds. (2) The last 3 to 4 years PGR seemed stalled in the amount of premium collected. (3) 65% origination for PGR is from agents, the 10% commission that PGR has to pay for it, even though lower than industry standards, is some disadvantage that GEICO does not have. Those are good points particularly the agency issue. Aren’t these commissions already included in the combined ratio?